The strength of the Coen brothers films is their well drawn and unique characters. Did anyone talk about the plot of No Country for Old Men? No they talked about the bowl haircut, the menacing eyes, the cow gun and ‘frendo’. The Hudsucker Proxy was all about Tim Robbins cluelessness and Jennifer Jason Leigh’s precocious loud-mouthery. 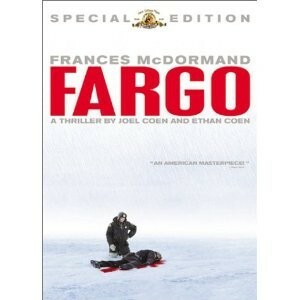 Fargo in based on a true story, and probably more an unfortunate and inconvenient story than a fantastic one, but the characters are so well drawn and realised that certain aspects and moments in the movie will stay with you for year. And if you had friends like I had in the 90s when we first watched this, you’ll hear a million lousy impressions of the think mid-west accent butchering phrases like ‘oh yah’ (why yes) and ‘yah, reet’ (you are correct). It is the height of winter, the landscape is coated in snow, the locals in thick winter garments, and for most watching tv in bed is preferential over the couch. Jerry Lundegaard is a car salesman working for his successful, wealthy and ruthless father in law Wade Gustafson in the small US town of Brainerd (the home of Paul Bunyan don’t ya know). The thugs get paid. The father in law gets his daughter back safe and sound. Jerry gets his money to look are his family. Everyone’s happy, no harm no foul. From here Jerry has the mother of bad days. The primary flaw in Jerry’s character is that he misjudges who he is dealing with again and again. While it must be difficult hiring the right mindless thugs to pull of a job correctly, one must be quite discerning with choosing who will be kidnapping your beloved wife and father of your son. Even when it is semi-fake. 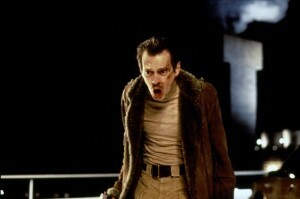 In retrospect I am sure Jerry would admit that Carl (Steve Buscemi) and Gaear (Peter Stormare) were unfortunate choices. Carl is a chatterbox, Gaear a dead eyed and nearly mute menace. Each have their strengths, but too often they prove incapable of working well together, leading to tension and hasty decisions. Jerry also incorrectly gauges Wade’s tenacity at negotiation, turning a simple transaction into a complicated one, which while still a fake ransom proves more dangerous due to the fact Carl and Gaear are the middle men. But Jerry’s biggest issue arrives in a short and whip smart package. With local police woman Marge Gundarssson. Marge is friendly, kind, logical and takes great pride in her job. She is also pregnant to her loving husband – and professional wildlife painter – Norm. In an early moment while investigating a murder scene Marge takes a brief time out to be sick, not as a reaction to the blood and bodies, merely morning sickness. With Jerry blundering the negotiations between Wade and the two dangerous goons and Marge doggedly following up clues in both Brainerd and the larger neighbouring town of Fargo, it seems that this once simple transaction is doomed to fail on many levels. The bodies pile up, the remaining characters get more and more edgy, and Marge continues piecing together the clues and getting ever closer. McDormand makes Marge far more than a stock standard cop. She deals with everyone she encounters in a friendly and sincere way, even when she knows they aren’t telling the truth, and her astonishment is real when confronted by some of the atrocities perpetrated through the film, but only in a way that expresses disbelief that people could choose that path over the right one. Macy is also great as a man gradually realising he is out of his depth and trying to limit the damage even as his carefully constructed plan dissolves around him. The supporting performances in Fargo are also uniformly excellent, with Stormare and Buscemi playing well off each other and Harve Presnell as the gruff and cantankerous Wade so effective that he nearly steals the show (and makes me think he was the template for Peter Griffin’s father in law in Family Guy). It is the characters, quotes (“he’s funny lookin”) and a couple of images (woodchipper) that will remain with you long after Fargo ends. It is an excellent ensemble piece from the masters of character driven narratives, the Coen brothers, and while it just misses greatness, it is well worth a look. Final Rating – 8 / 10. Lean, smart and character driven, with memorable performances and moments.